1/2 cup of chopp onions. 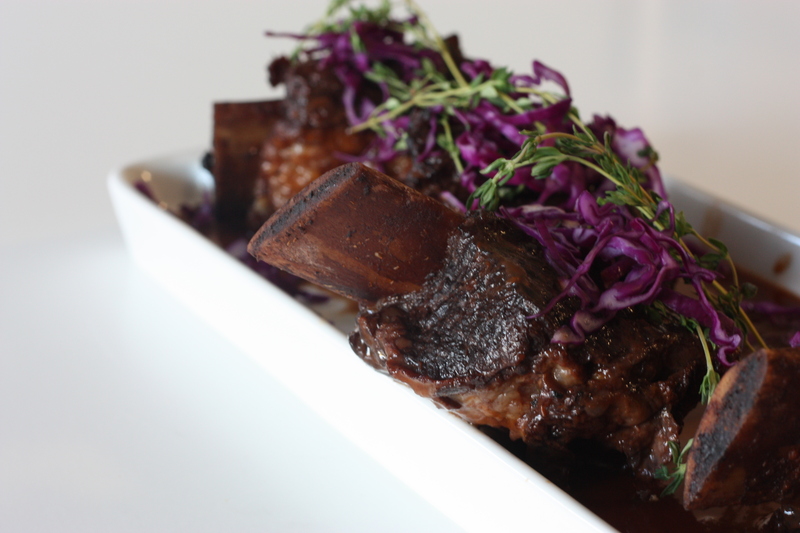 First season your short ribs. Then in a pot on high coated with a thin layer of olive oil, sear the beef short ribs on all sides. This should take about 2 or 3 minutes per side. Remove the ribs to a plate. Add the onions and celery to the pan and saute for about 1 minute. Add the garlic. Cook for another 30 seconds or so, then deglaze with the wine, scrapping all of the bottom bits up (almost like your washing the pot with wine haha). Let the wine boil for about 4 minutes, then drop in the beef broth along with the Sage and Thyme. 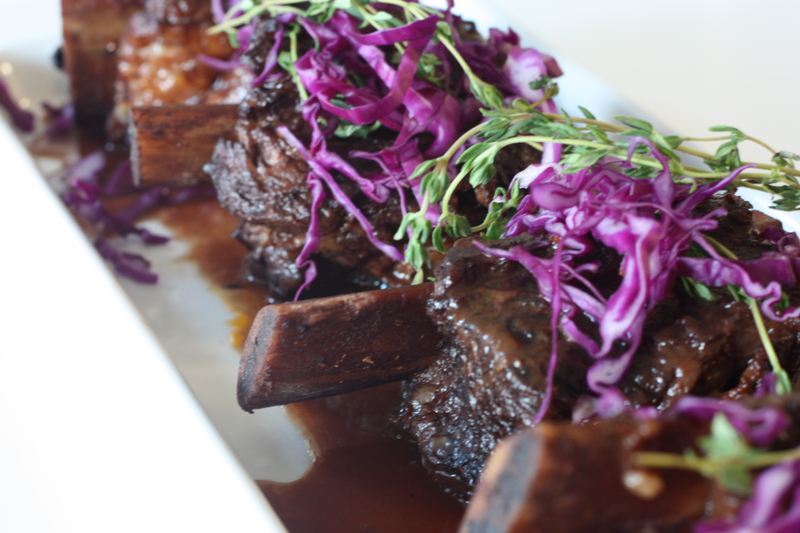 Throw the short ribs back in, with all the juices produced on the plate. Cover the pot, reduce the heat to low, and stew for about 3 hours. Occasionally mix. Then, removed the short ribs, and run the liquid mixture through a sift clarify the sauce. Place the ribs and sauce in a sealable contained, and refrigerate over night or at least until the fat from the sauce is solid. The main reason for doing this is mainly because of the fat. There’s a lot of it and I didn’t want it in the glaze (it wouldn’t work otherwise). After the fat solidifies, remove it with a spoon. Drop the ribs and sauce into a sauce pot again and bring to a boil, reduce heat to low, and let the sauce reduce by a third or so. It’s going to be a pretty think sauce. Season as necessary. This should only take about 20 minutes or so. And there you have Thanksgiving in a red wine sauce. Reminded me of stuffing, but just slightly. But there is no doubt that this dish put a little holiday cheer for those who had some! 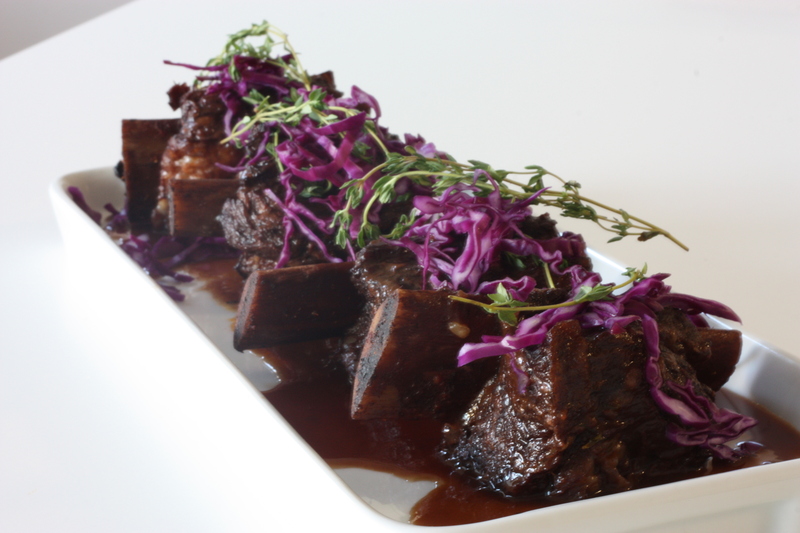 This entry was posted on November 11, 2012 by rrfoods in Dinner, Lunch, Redmeat, Redmeat and tagged beef, beef broth, braised, glazed, red wine, sage, short ribs, snack, syrah, thanksgiving, thyme.